I'd heard a lot of good things about chefkirk, and I was pleasantly surprised when this disc found its way to my doorstep. The packaging here is a lot less colorful then his other releases are reputed to be. Instead of the seemingly trademark green and orange you get a very minimalistic back on white design. Not that that is a negative thing, not at all. Just something I felt was worth pointing out. The album begins with the 30 second long 'a look at the past', which is a mostly gentle bubbling noise hiss, a perfect introduction to the harsh noise of the second track, '9242LFTO'. '9242' starts off with the aforementioned storm of harsh noise, 20 seconds of moving hiss and screaming pitch bends. About 30 seconds into the constantly moving piece things become more minimalistic for a short while. Still harsh, but more jerky, then about 50 seconds into it it becomes layered again and very rhythmic, noises building themselves up and tearing themselves apart. At about 2 minutes, the piece becomes more minimalistic for awhile, different noises coming on and off, all very subtle. The pace is kicked up once again around the 3 minute mark, and a high pitched squeal becomes the focus of sound, accompanied by a revolving door of hiss and rumble. This is by far one of the best pieces here, it wastes no time and the execution is great. The third track '30904', has more of a laid back, minimalistic feel to it for the first minute or so, low end rumble swirling slowly in and out of your head. At about 2 minutes some high octave sine waves come in for awhile and then are eventually replaced with some found sound moving and shaking. Eventually the found sound is looped and layered upon itself, making an interesting climax to the piece. After awhile the layering stops and the piece is again at a more minimalistic stance, changing constantly between the original found sound source, loop skipping and misc. sine wave twirling. at around seven minutes things get harsher then before, jerky distorted skips and beeps forcing themselves into your skull, making your head explode. This continues for the last couple of minutes of the track, until it fades away into minimalism once again, and then ends. Track four,'203043L', is a forty second reverb drenched noise piece, consisting of basically the same sounds being played on and off. the following slab of sound, '10152LFTO', is a somewhat spaced out track of looped and distorted samples, with misc. noises jumping in and out of the seven minute track. It's not a bad track, but it just doesn't have the same intensity or pacing as the earlier tracks, making it less interesting. Not horrid mind you, just somewhat boring. The next track, '226041.5' suffers from the same illness as the previous track, the noises failing to capture much your attention. But the nefariously short title track more than makes up for the latter track's transgressions, as it is a very energetic , very rhythmic piece, the only flaw of which i could find being the aforementioned short length. The eighth and final track, 'Satan is from texas', starts off with a mixture of low end and high end, the low a noise rumble, the high somewhat of a piano ballad, but mutated, bastardized. Slowly the ballad becomes more twisted, more warped, until it resembles a large, venomous snake rather than a prissy ballerina. The snake goes through different stages of progression, leading up to a long, bloody battle with a chainsaw. Conclusion: Though at times it can get a bit daunting, the high points far outweigh the low. 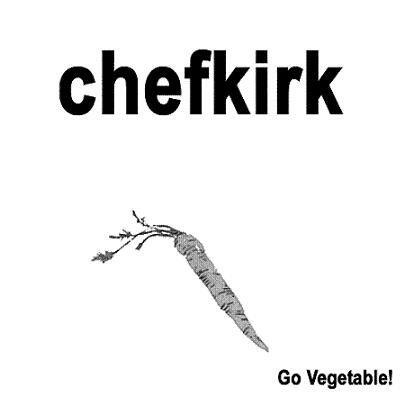 If you can find Go vegetable!, buy it, before it grows it's roots and runs away.